B&O Play launches "ultra flexible" BeoPlay H2 on-ear headphones | What Hi-Fi? It's been almost a month since B&O Play unveiled its first Bluetooth speaker with the BeoPlay A2, but now the company returns to somewhat more familiar territory with a new pair of headphones. With the new BeoPlay H2s, you'll be getting an "ultra flexible" pair of on-ears that include a Bang & Olufsen 40mm custom driver and a bass port that promise a "full and rich music performance". 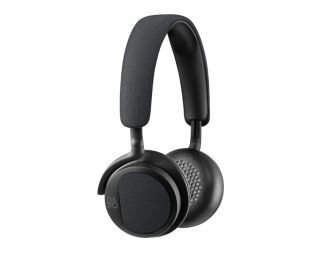 According to B&O Play, these new cans are being targeted at music enthusiasts and incorporate Bang & Olufsen's signature sound for an "honest, powerful and passionate sound experience". Jakob Wagner, the Danish industrial designer behind the BeoPlay H6s and BeoPlay H3s, is also responsible for this latest release – with a large chunk of emphasis put on the ergonomic design. The adaptive headband is designed to fit the size of your head after using it for a couple of minutes, while ear pads and mono arms are slightly angled for comfort when hung around the neck. Textile is the main material used in the construction of the headband and ear cup, with the aim of creating a "clothing-like appeal" that better fits in with your "style and preferences". Wagner said: "My challenge was to express that through every detail of BeoPlay H2 so that listening becomes an authentic experience for all senses. We did that by considering each part separately – to improve and simplify." B&O Play head Henrik Taudorf Lorensen added: "With BeoPlay H2, we make the amazing Bang & Olufsen sound available in a new category of products and with a design and user experience that matches the sound." The BeoPlay H2s come in three finishes: Carbon Blue, Silver Cloud or Feldspar Green – and go on sale at the end of the month for £169, with cable accessories to follow in the new year.